Saturday, October 10 1908 -- William Randolph Hearst is touring the country giving speeches in support for his Independence Party. As Hearst tours, he continues to produce further letters in which high government officials are implicated as collaborators with Standard Oil. 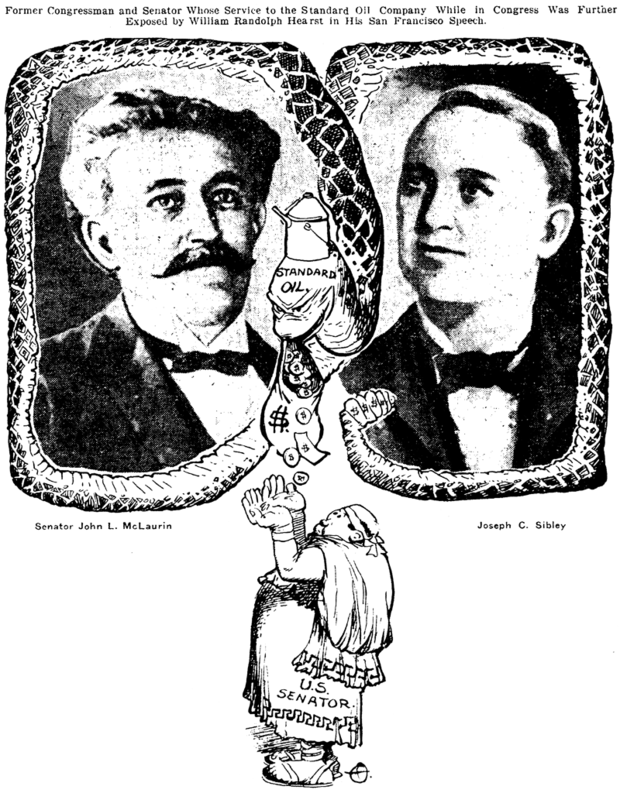 In a San Francisco appearance, a new letter is read by Hearst in which former senator John McLaurin and former congressman Joseph Sibley are exposed. Harry R. Lutke was born in Wisconsin on December 10, 1920. His birth date was found in a public record at Ancestry.com. The 1920 U.S. Federal Census, which was enumerated in January, listed Lutke’s parents, Arthur and Laura, and six-month-old sister, Alice, at 410 7th Street in Merrill, Wisconsin. His father was a collector for the newspaper. In the 1930 census, Ripon, Wisconsin was the home of the Lutke family which added another son, John. They resided at 215 State Street. 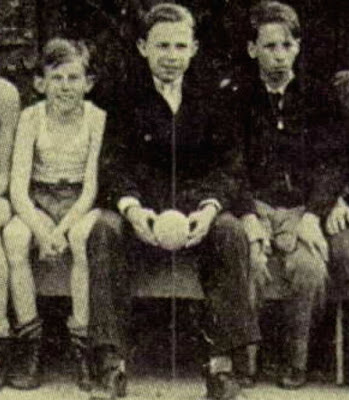 Lutke attended Ripon High School and was on the basketball and playground baseball teams. The school yearbook was called The Tiger. …The Dinnings were a very musical family of nine children, all of whom started singing harmony in their local church on Sundays. Afterward they would continue to sing some more when they got home. Ginger, her identical twin Jean and older sister Lou, started to win amateur singing contests before the age of 10, and later would perform with their older brother Ace's orchestra. With little experience but a lot of ambition, The Dinning Sisters were born. From that point forward they knew what they wanted to do. So they left at the age of 16 and headed to the big city of Chicago and auditioned for a radio show and got the job and a contract with NBC radio. From there they went on to get a recording contract and make several records, which did very well. Their biggest hit was the song “Buttons and Bows,” which went to No. 1 on the charts. Lutke lived in Chicago when he married Ginger. He may have attended the Chicago Academy of Fine Art or the Art Institute of Chicago for his art training. The Dinning sisters, tuneful trio of radio’s National Barn Dance, have received reams of fan mail from G.I.’s overseas since the Paramount musical “National Barn Dance” has reached the fighting fronts. However, the most prized comment on their appearance in the movie, from Ginger Dinning's husband, Sgt. 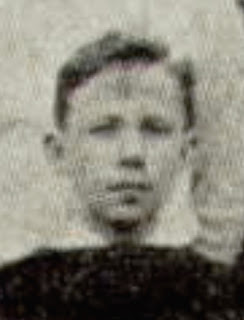 Harry Lutke, who has been serving overseas for more than fifteen months with the Signal Corps. Sgt. Lutke writes that one of the rare bright spots in his life on Germany’s Western Fronts, was the recent surprise showing of “National Barn Dance” in an impromptu theatre not far behind the firing lines. Appropriately enough, the Army’s Special Services officer chose an abandoned German barn in which to run the film story of the popular air show of the same name. 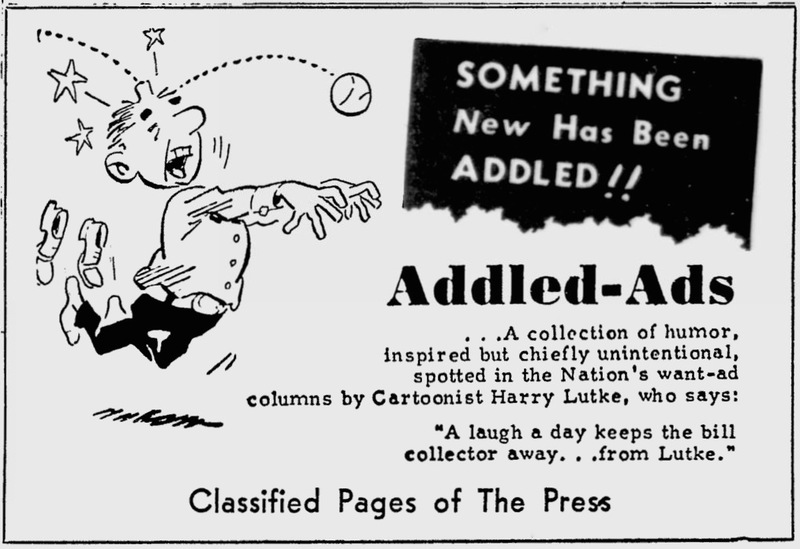 Lutke and Bob Schless produced Addled-Ads which began October 3, 1949. One of the newspapers that carried it was the Pittsburgh Press. The panel ended in late 1951. The Chicago newspaper, Daily Herald, March 16, 1951, wrote about the upcoming St. Patrick's Day Dance program with the Dinning Sisters as headliners. In addition to the variety of entertainment, Lutke also appeared. To supplement the program, the committee also is featuring Harry Lutke of Palanois Park, husband of “Ginger” of the Dinning Sisters in a “Chalk Talk.” Mr. Lutke is a cartoonist of note and will present an unusual type of cartooning with audience participation. Prizes will be awarded for those in the audience who participate. It is fascinating amusement and sure to delight those present. Mr. Lutke was formerly Assistant Artist to Frank Willard, the creator of the well-known comic strip, “Moon Mullins.” Mr. Lutke at present is engaged in newspaper cartoon work. He is the creator of the syndicated cartoon “Addled,” a combined cartoon and advertising arrangement. 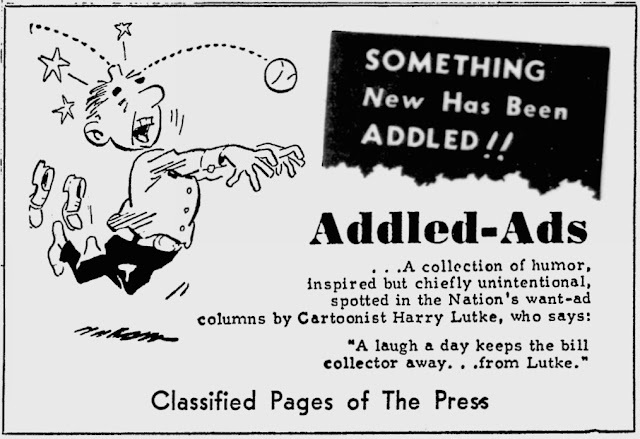 “Addled” is presently running in twenty-two newspapers, mostly in the East, and will soon run in a Chicago daily. The article also mentioned his home address, “46 N. Forest ave., Palanois Park”. I wonder how many other comic strip creators have married people who were famous in their own right (for reasons other than comics). The only one I can think of is Garry Trudeau. 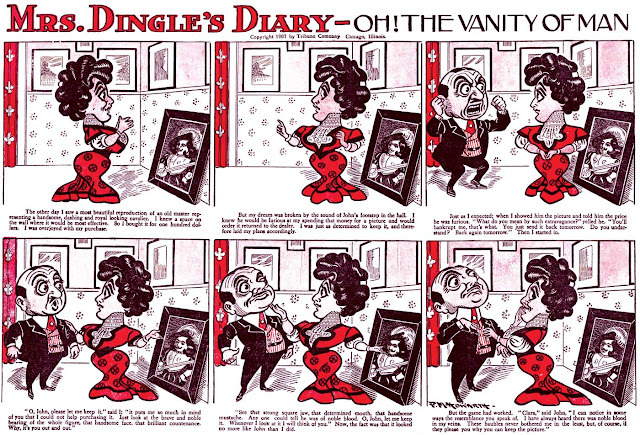 Cartoonist Fay King married boxer “Battling” Nelson in 1913. Harry Lutke passed away on September 26, 2015. 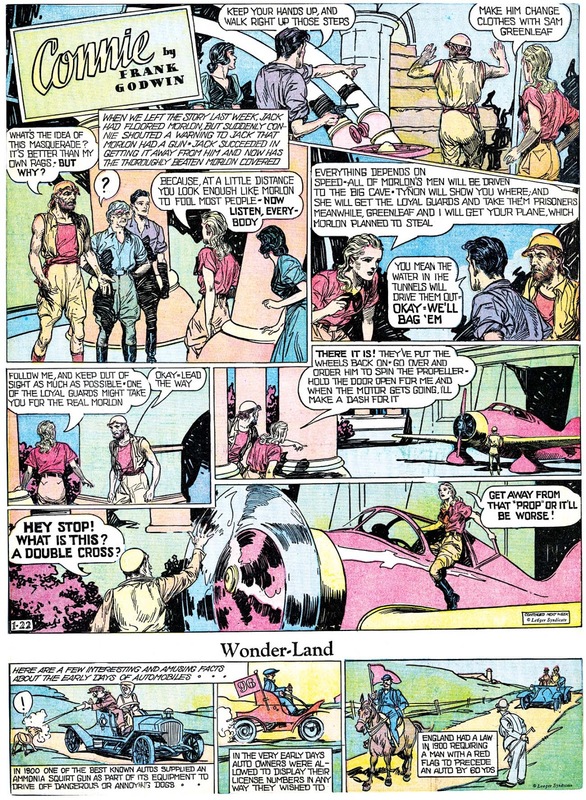 In their never-ending quest for sales, syndicates will offer editors a cartoon feature designed to complement just about any page of their newspaper, except maybe the obituaries. 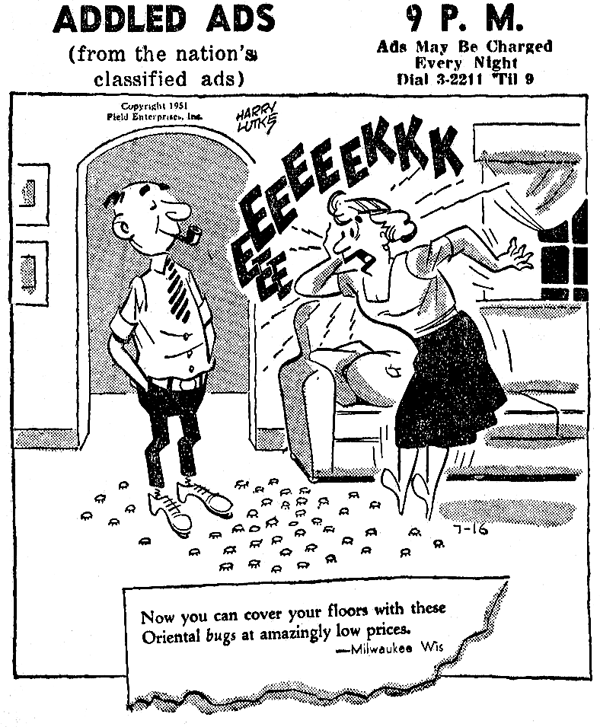 Addled-Ads, whose utterly superfluous hyphen was thankfully dropped by the time of the samples above, was offered by the Chicago Sun-Times' Field Syndicate for classified ad pages. 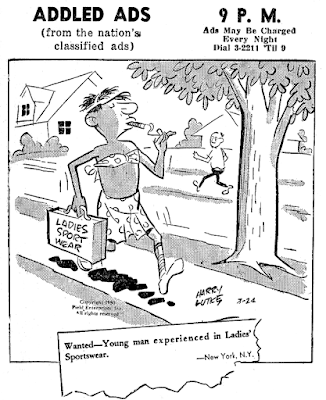 The feature was drawn by Harry Lutke and the humorously mis-worded classified ads collected by Bob Schless. 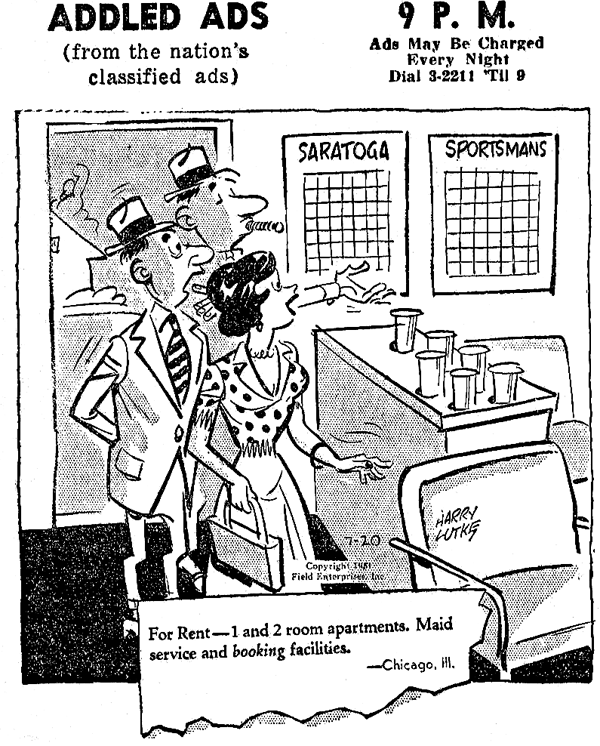 The feature debuted on October 3 1949, and found few takers in newspaperdom. 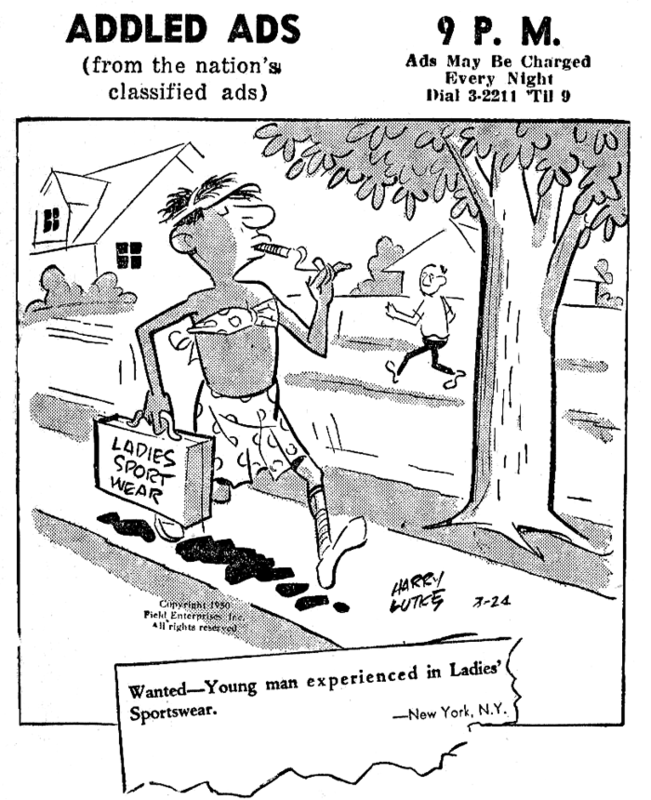 Addled-Ads limped along for a few years, but was put to bed sometime around November 1951. I like the premise, too bad the gags aren't funny. These are great! So much funnier than most strips today. And they're well drawn. Looking for some more, I found that it was syndicated as well by the Chicago Sun and Times Co. I found at least one (with hyphen) on Oct 24 1949 in the Moberly Monitor-Index. And more in the Gridgeport Telegram. The scope of the jokes seems hindered by the fcat they are using real ads. Moberly has the first one as well, oct 3, 1949: "For Sale - A fine large dog. Will eat anything. Is very fond of children." George Frederick Kaber was born in Philadelphia, Pennsylvania, on November 15, 1860, according to a 1924 passport application. The 1870 U.S. Federal Census recorded Kaber, his Wurtemburg-born parents, George and Mary, and younger sister, Julia, in Philadelphia. His father was a cabinetmaker. A 1870 city directory listed the Kaber’s address as 407 South 5th Street. Information regarding Kaber’s education and art training has not been found. Kaber’s occupation was draughtsman in the 1880 census. He lived with his parents in Philadelphia on Orleans Street. The Philadelphia, Pennsylvania, Death Certificates Index, at Ancestry.com, said Kaber’s father passed away November 13, 1881. At some point Kaber moved to Chicago. The 1887 Chicago city directory said he resided at 52 Pine Street. In 1888, Kaber’s address was 246 Ohio Street. A family tree at Ancestry.com said Kaber married Nellie Robie on February 14, 1893 in Milwaukee, Wisconsin. According to the 1910 census, this was his second marriage. It is all very well to talk about artists and illustrators, and the high price they command, but there is a modest little man on the Park Slope whose income oversteps any of theirs—save, perhaps, C.D. Gibson’s—and who nets a great part of the year over sixty dollars a day. His name is Frederick Kaber, and his home is a simple little house on Prospect place. 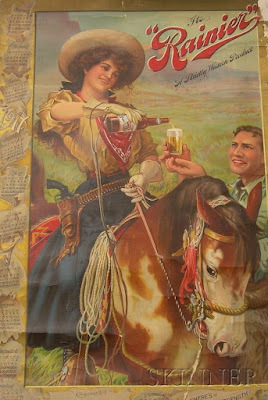 He makes designs for lithographers, and many of the most famous colored advertisements come from his water color brush. Representatives of the great firms in the business come to him from everywhere, and each hour of his time is mortgaged for months ahead. Kaber’s next documented address was found in the 1898 and 1899 Brooklyn, New York city directories, which had him at 266 Decatur Street. According to the 1900 census, artist Kaber and Nellie had two daughters, Nellie and Grace. His address in the directories was the same in this census and the 1905 New York state census. Kaber’s mother passed in Philadelphia on November 20, 1905. 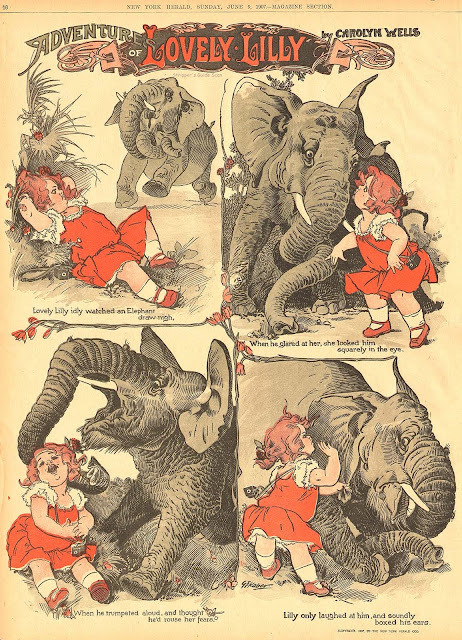 According to American Newspaper Comics (2012), Kaber drew the Carolyn Wells-penned series, Adventures of Lovely Lilly which ran in the New York Herald from 1906 to June 9, 1907. 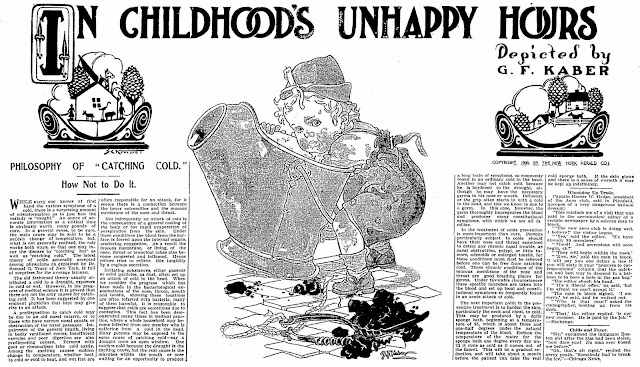 Also in 1906, Kaber illustrated In Childhood’s Unhappy Hours (below) for the New York Herald. 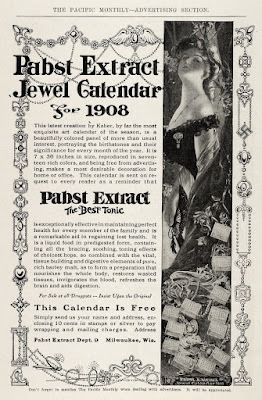 I believe Kaber was the artist who did the artwork for the 1908 Pabst Extract Jewel Calendar. 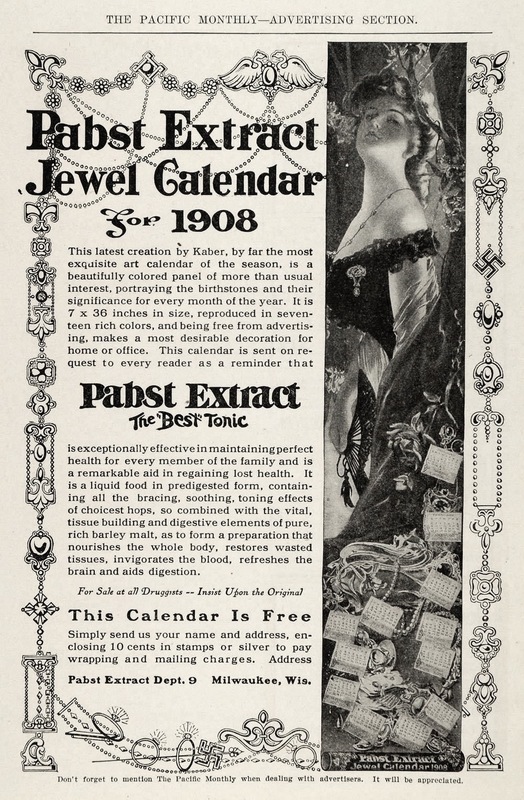 The first sentence of the advertisement begins: “This latest creation by Kaber…” The style is similar to Kaber’s 1911 calendar art for Rainier Beer. In 1912, Kaber was one of several artists producing artwork for M. Boettiger, of New York, who held the copyright. 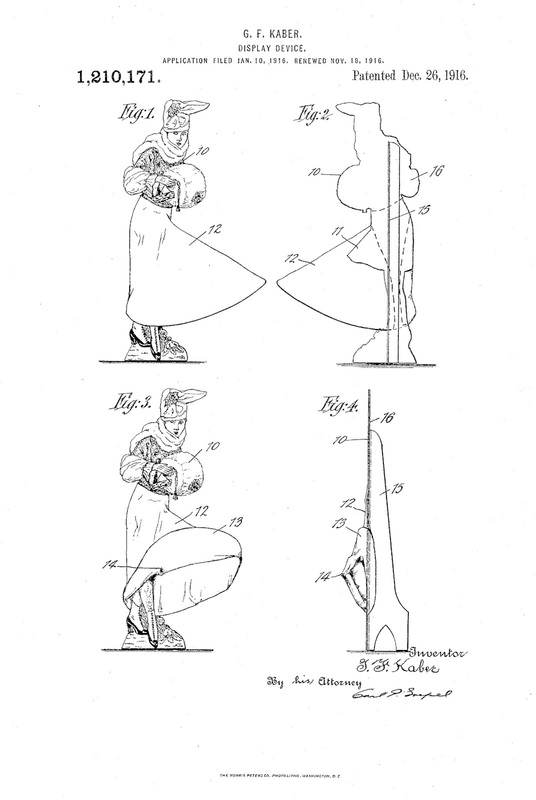 In 1916, Kaber was granted a patent for a “display device”. 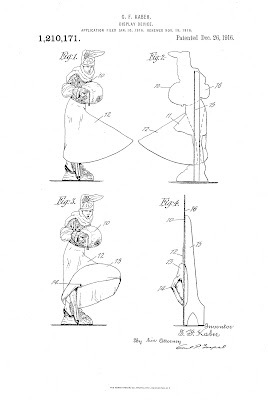 The pose of the woman in the patent drawing is similar to the manufactured display of a woman. Kaber’s daughter, Nellie, was the first to marry in the early to mid-1920s. Her husband was Edward Dennis Lyons according to the family tree. The New York Times, April 19, 1925, noted the marriage of Grace. The marriage of Miss Grace Kaber, daughter of Mr. and Mrs. G. Frederick Kaber of 266 Decatur Street, Brooklyn, to William C. McTarnahan of this city and Boston, formerly of California, took place yesterday at the home of the bride’s parents. The ceremony was followed by a wedding breakfast at the Ritz-Carlton. The bride has appeared in motion pictures and has also acted in a number of Broadway successes. Mr. McTarnahan is President of the Petroleum Heat and Power Company. Following their wedding trip to Chicago and the Pacific Coast, Mr. and Mrs. McTarnahan will return to make their home at the Westchester Biltmore Country Club, Rye, N.Y. 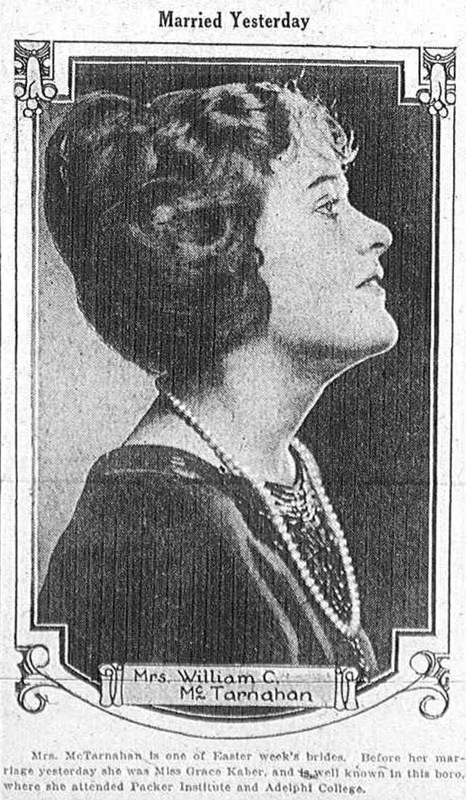 The San Francisco Chronicle, June 16, 1926, said the couple honeymooned in San Francisco and told of her acting. …Mrs. McTarnahan said that her honeymoon was the first attraction to take her away from Broadway. Some time after the wedding, Kaber and his wife made their second trip to Europe; the first was in 1913. According to the Brooklyn Daily Eagle, June 14, 1926, Kaber was a juror in the John Maxwell murder trial. Maxwell and two accomplices murdered a woman during a robbery. Maxwell was found guilty and executed in the electric chair at Sing Sing prison on December 10, 1926. Lyons—On Wednesday, Oct. 6, 1926, Edward D. Lyons, in his 40th year, husband of Nellie Kaber Lyons of 576 Eldert lane. Funeral services at the Fairchild Chapel, 86 Lefferts pl., near Grand ave., Brooklyn, Friday evening at 8 o’clock. Interment private. Kaber’s address in the 1930 census was 290 Carroll Street in Brooklyn. Kaber continued working as a commercial artist. A 1939 passenger list had this address for Kaber’s wife, 18 Watson Avenue, Ossining, New York. Kaber’s daughter Grace and family also resided in Ossining. Kaber and his wife returned to Brooklyn in the 1940 census. Their home was 24 Monroe Place, which was daughter Nellie’s former address on the aforementioned 1939 passenger list. Kaber painted portraits of his family as well as a self-portrait. Letters by Kaber’s daughter, Grace, were auctioned in 2009. The description said she wrote a thank you letter to her 90-year-old father, who was erroneously called her grandfather. Kaber passed away in 1951 according to the family tree. It’s not clear if his death preceded or followed that of his son-in-law, William McTarnahan, who died October 18, 1951. Grace passed away in the late 1950s, who was followed by her mother, around 1960, and sister, Nellie, around 1964. F.M. 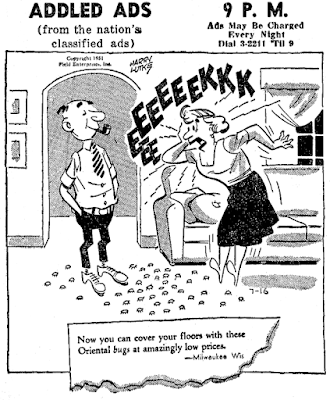 Howarth did most of his newspaper cartooning work for Hearst, but he did make an occasional foray elsewhere. Of course, with his incredibly distinctive style, he certainly wasn't about to try moonlighting under the radar. 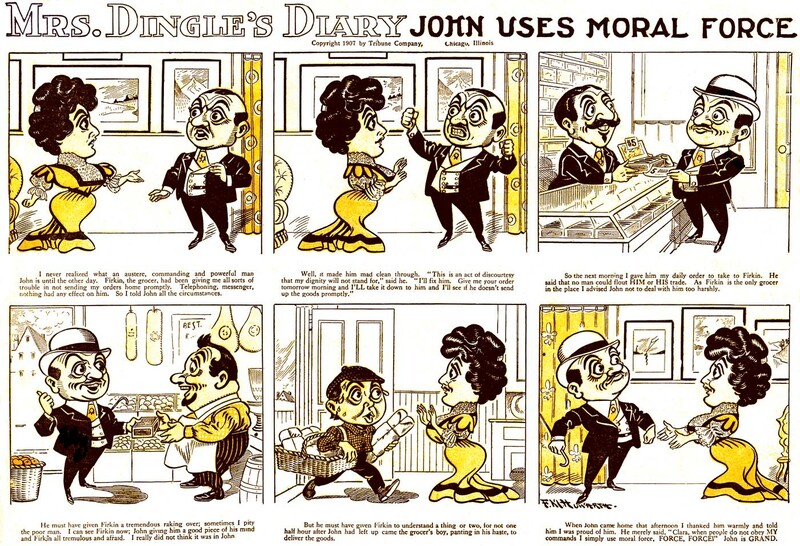 In 1907-08, Howarth did several series for the Chicago Tribune, including this one, Mrs. Dingle's Diary. I rather like the idea here that we see the gag acted out, but then Mrs. Dingle's inner thoughts sometimes put a different spin on the situation (best in the top example). 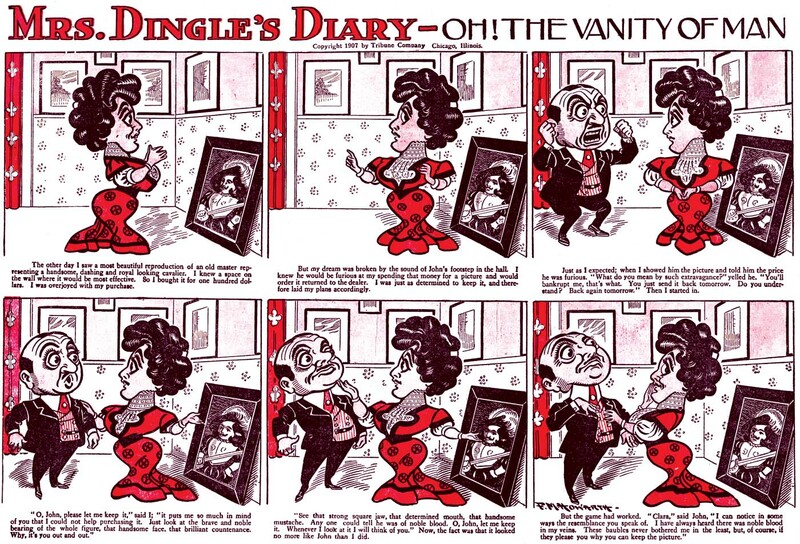 Mrs. Dingle's Diary ran in the Tribune from June 9 1907 to March 22 1908. 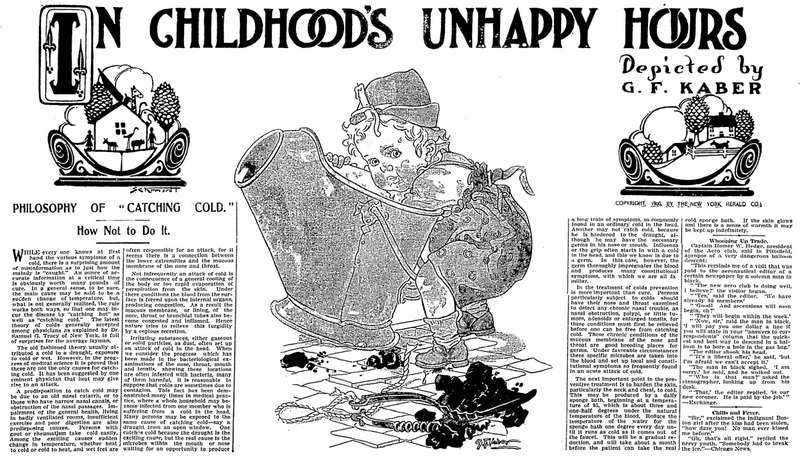 Sadly, Howarth was dead before the end of 1908, extinguishing his truly unique brand of cartooning. Thanks to the late Cole Johnson, who supplied the sample images. 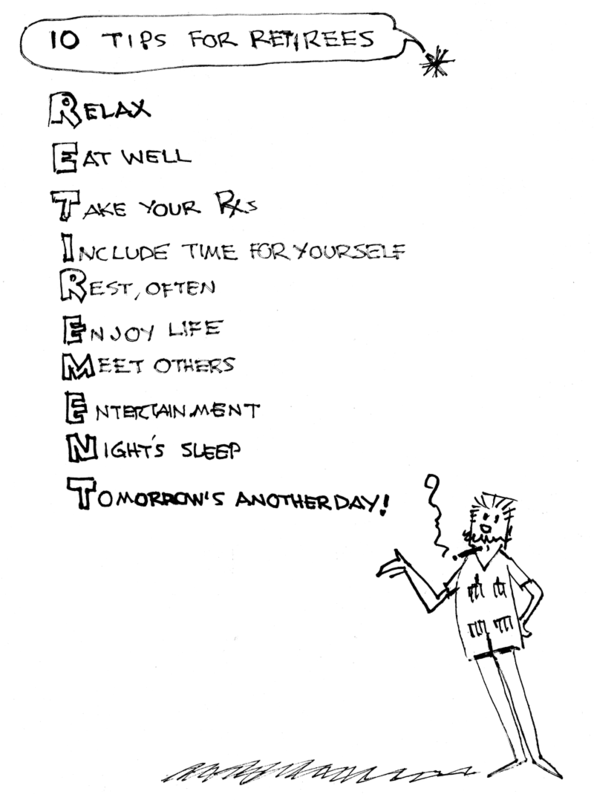 Those are great tips for ANYONE to live by!